> Similar to the Chicken Goujon recipe & method; Start by preparing the coating mix, do so by adding all the dry ingredients along with some seasoning into a bowl and mixing together well. Whisk up the egg until it's nice and smooth. > Slice up the courgette into chunky fries. To ensure they aren't too crunchy, I like to saute the courgette in the pan for a couple of minutes before coating them in the mix (optional). > After you have prepared all your ingredients make sure to get the pan nice and hot with the Lucy Bee coconut oil melting. 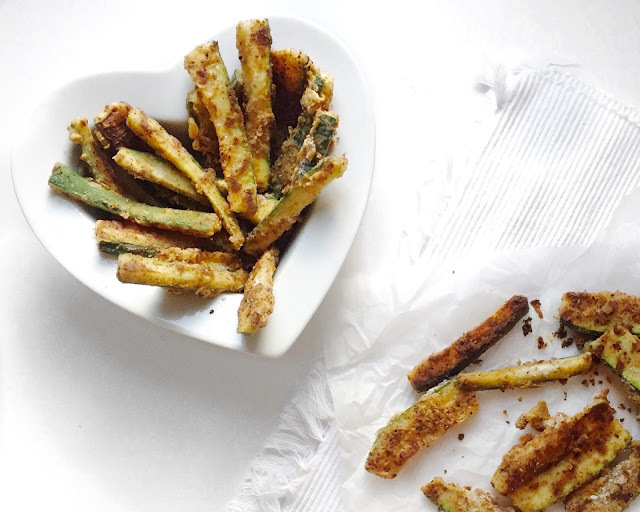 > Then simply take each strip of courgette and dunk into the egg mix followed by the flour mix and place onto the pan. Make sure to turn over so both sides are cooked and crunchy. Once done, set aside on a plate with some kitchen roll on to drain off any excess oil.